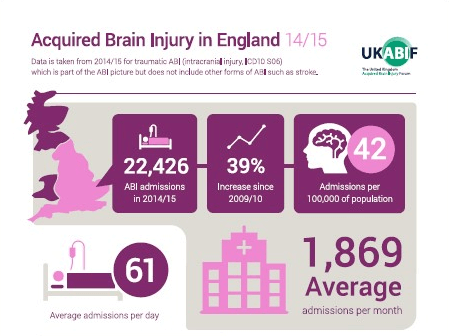 Our latest report published in collaboration with the charity UK Acquired Brain Injury Forum (UKABIF) highlights that many hospital admissions in England for acquired brain injury (ABI) caused by trauma involve people aged over 75. 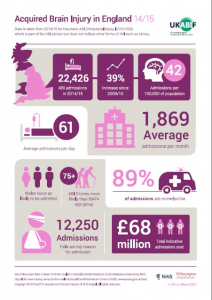 The report, which is based on English Hospital Episode Statistics (HES) data, found that 40 percent of hospital admissions in 2014/15 for traumatic ABI, which is defined as an injury to the brain caused by an external force, were for people aged over 75. When classified via age groups, the data showed there were 8,999 hospital admissions for traumatic ABI for people aged over 75 in 2014/15, compared to 13,387 for all other age groups from under 15 to 65-74 in the same time period. The report found that there had been a 39 percent rise in the total number of hospital admissions for traumatic ABI during a six-year period from 2009/10 to 2014/15, although these figures may be attributed to improved identification. This study did not examine all Acquired Brain Injuries data in HES, so it is likely that the actual figures for traumatic ABI are likely to be even higher, given differences in recording. Dr Andy Eynon, Consultant in Neurosciences Intensive Care, Wessex Neurological Centre, said: “Major trauma networks went live in London in 2010 and nationally in 2012. Now they are in place we have greatly improved the identification of and care for all patients sustaining major trauma. This includes better recognition of the mechanisms that cause major trauma in the older person, the commonest of which is a fall from standing. Four of the top five listed causes of traumatic ABI in 2014/2015 across all ages were falls, including on or from stairs and steps, and falls on the same level from slipping, tripping and stumbling. In fact, ‘any type of fall’ was listed alongside 54.8 percent of admissions. Professor Mike Barnes, Chair, UKABIF, which promotes understanding of all aspects of Acquired Brain Injury and provides expert advice to UK policy makers, said: “We need to increase awareness and understanding of ABI and its life-long impact on individuals and their families and carers. “This report shows that every year thousands of people in England suffer a traumatic brain injury and have to live with the long-term physical, cognitive, educational and psychosocial consequences associated with it.